Hand-made with Greek olive oil and a traditional recipe from Kythira island. Natural products without preservatives or flavor enhancers. Is the Greek word for anything with origin from Kythira island. It is pronounced kee-thĚe-ron. These hand-made, bread-crackers, make exquisite hors d’ oeuvres. Serve them with sticks of fine Greek cheese, with diced tomatoes, olive oil and wild oregano; or with finely sliced Italian Parma ham, or smoked salmon. Spread olive-pate, mullet roe, caviar or foie-grass. Enjoy them for breakfast: spread butter and honey or your favorite marmalade. Eat them at work as an all-day Mediterranean snack with olives, cheese & ham, olives or ham. 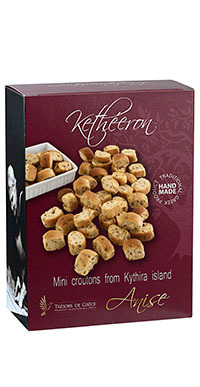 Use them crumbled as healthy croutons (Kythira bread-crackers are baked instead of fried) in green salads and soups. Hand-made, traditional Greek product. Healthy, crunchy and incredibly tasty. wholegrain wheat flour, Greek oil olive oil from Kythira, anise, sugar, salt, yeast, water. Allergens: flour – contains gluten. trans fat, animal fat or protein, emulsifiers, preservatives, or flavour enhancers.